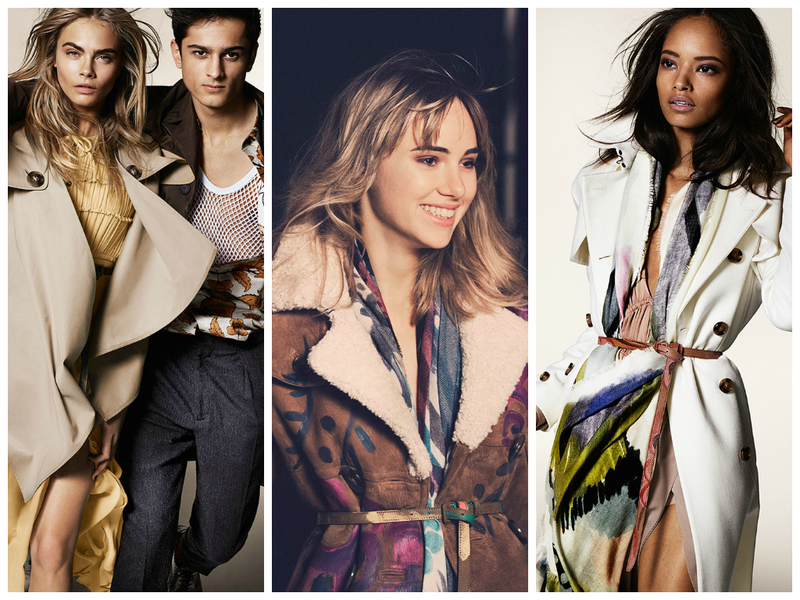 "Burberry is a 158 year old global brand with a distinctly British attitude." Burberry. One of Britain's biggest brands. Founded 158 years ago, Burberry has been described as one of the best in the world. The brand reflects British style, and thats why I love it so much. Another reason why I love them so much? Cara Delevingne of course - she's been modelling and walking for them for a while, and she definitely has the face to match such a beautiful brand. I decided to write a post about Burberry because I am so passionate about them. Even as my FRA friends, when we walked past burberry this week on Bond Street, I was just bursting to go in. I just love the elegance and sophistication that they bring to the table. 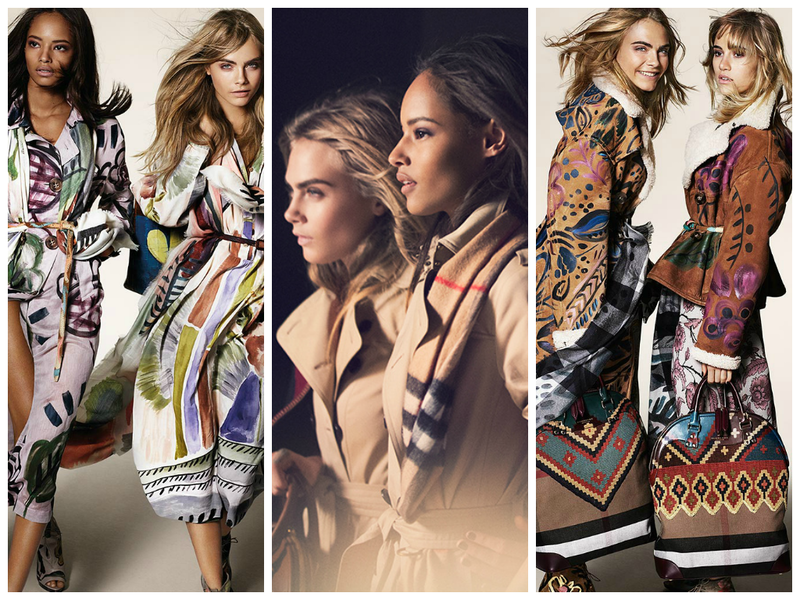 From the iconic Trenchcoats to the infamous tartan print, Burberry has never put a foot wrong. I wanted to feature their A/W collection because not only is it appropriate because we've started the A/W season, but because it is by far my favourite campaign (their S/S14 not far behind mind!!). The campaign features the beautiful Cara, aswell as Malaika Firth who I can only describe as 'dynamic' in this campaign. All 3 being British, their captivating beauty transfixes us onto this gorgeous campaign. Malaika herself is fast becoming one of the world's most lusted after models and she totally nailed these looks! Suki, who is currently dating Bradley Cooper, is one of my favourite models in the industry itself. She is just amazing, is it possible to fall in love with someone you have never me? I can confirm, you can indeed. Her cool personality and gorgeous smile inspires me, and the way she wears her clothes is always impeccable. I am so glad these women are representing Burberry! If you follow me on Instagram or Twitter (or both for that matter) I am sure you will be aware that I am obsessed with Burberry and in particular, two pieces. The Trenchcoat, and The Monogram poncho. They're two pieces to die for. In the first image above, Cara is wearing both pieces. Knowing she most likely has got those pieces for free, makes me want to cry :( However, I am so glad the trench and poncho is two of the great pieces this A/W. You can find both in stores such as Topshop. Topshop do some gorgeous capes and ponchos this A/W so it's definitely worth a look ladies! Trenches are also sold in most places, but I would recommend Zara. Also this season, Burberry have introduced floral print pieces, which I absolutely adore. The collection also features the "Bloomsbury Bag" which is a key feature of this collection. They have ventured out from their classic look, and they have made the right decision, the pieces are beautiful! I cannot wait to see the Resort 2015 pieces!